Now The Details: Should the Media Reprint the Charlie Hebdo Cartoons? Should the Media Reprint the Charlie Hebdo Cartoons? It's a dilemma for mainstream media organizations. If they reprint, there is a risk further angering extremists who cannot be mollified by any gesture short of a complete capitulation. If they don't reprint, media organizations are being accused of cowardice, of "allowing the terrorists to win," and failing to live up to their own standards of a free press. This are two competing but equally valid issues: one is free speech and the consequences to that were demonstrated in the streets of Paris today. But the other, equally valid notion: the affirmative obligation of a news organization or any media to keep its employees safe. In Canada, the CBC will not show the cartoons. In the CBC's French-language service, Radio-Canada, they have decided to show them, possibly in solidarity with the journalists at Charlie Hebdo. This is a time when our strongly held beliefs about a free medium in a democracy are not universally shared. 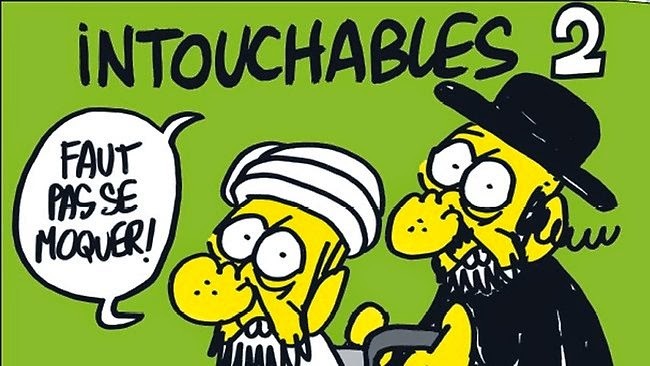 As we saw today in Paris, a media organization could republish the cartoons in support of free expression, and risk endangering its own employees. Or it could not run the cartoons and be accused of cowardice in the face of a threat of terrorism. In September of 2005, the Copenhagen newspaper Jyllands-Posten published a series of cartoons that openly mocked Islam and the Prophet Mohammed. At NPR, management decided not to repost the cartoons that connected the Prophet Mohammed with terrorism. The thinking at NPR was that the cartoons were freely available for all to see on the Internet. NPR was not serving its public by exacerbating tensions. Indeed, very few US media organizations would reprint them. The Philadephia Inquirer was the only major American newspaper that did. When American troops were fighting in Iraq, it was seen as not being the right thing to do when American policy was trying to win hearts and minds in the Muslim Middle East. But almost every major European media outlet republished the cartoons. The tradition of a free press in Europe is different from the North American approach. North Americans are often more reluctant to offend, compared to the "take no prisoners" approach to satire in Europe. The Israeli media wouldn't republish the cartoons either. Americans and Israelis, it seems, have a different understanding of the power of religious fervour. The blogosphere has the freedom to publish; legacy media have additional elements to consider. It's easy to say "publish, and be damned." It's another thing to live with those consequences.